A new attachment designed to clear accumulated snow from truck, trailer and bus rooftops is now available through Caterpillar’s dealer network. TrucBrush is a polypropylene-bristled attachment that connects to and is powered by a front-end loader. 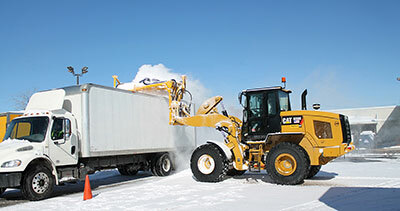 The mobile method allows snow service vendors and fleet maintenance personnel to quickly, effectively and safely clear snow off multi-heighted vehicles prior to transit, Caterpillar said. “We are proud to offer TrucBrush through Caterpillar Inc.’s distribution channel as they are global leaders in providing solutions to the transportation and snow management industries,” said TrucBrush Corporation Vice President Debora Babin Katz. In 2016, TrucBrush was recognized for its attachment by the Smaller Business Association of New England with a Rising Star Innovation Award and the Industry Commitment Award from the Snow & Ice Management Association (SIMA) for outstanding innovation, support and customer service.